Following closely on the heels of 3.0 I am pleased to announce version 3.1. When you open a Note you will see a new button on the toolbar. Toggle this button “on” to highlight the verse in the Bible. It will use the colour of the Note as the highlight colour. The highlight will be applied to the verse in the Bible, and also to the Note in the Side Panel. This is a really handy way to make a verse stand out from the rest while reading your Bible – perhaps to indicate a major point for the field service, or for personal application, or just a favourite scripture. 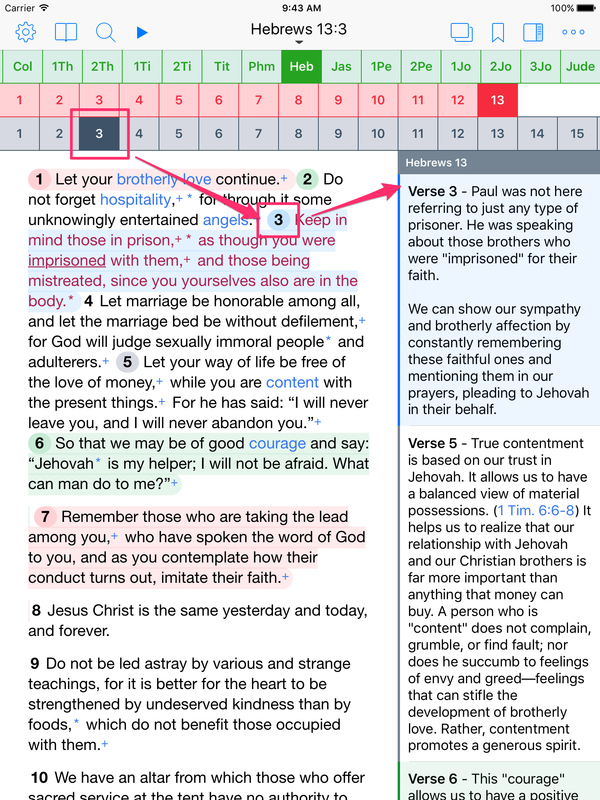 See the screenshots below for an example of the button and highlighted verses. In the 3.0 update the Side Panel started to support links and markdown formatting options such as bold, italics, underlining, highlighting etc. But if you went into the Note window it did not show you these new features – it went straight into “edit” mode so that you could start changing the contents of the note. This is not ideal in situations where you jump straight from the verse number to the note. The Note window will now show you a fully formatted note with links and highlighting etc. 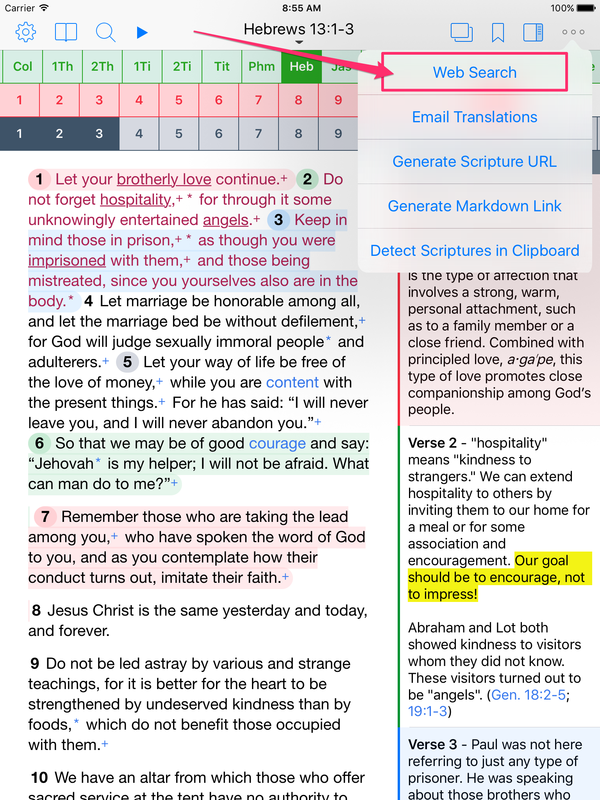 Links to scriptures and external websites and apps work just the same as in the Side Panel. If you want to update the contents of the note just tap anywhere and it will switch to “edit” mode and enable the keyboard. 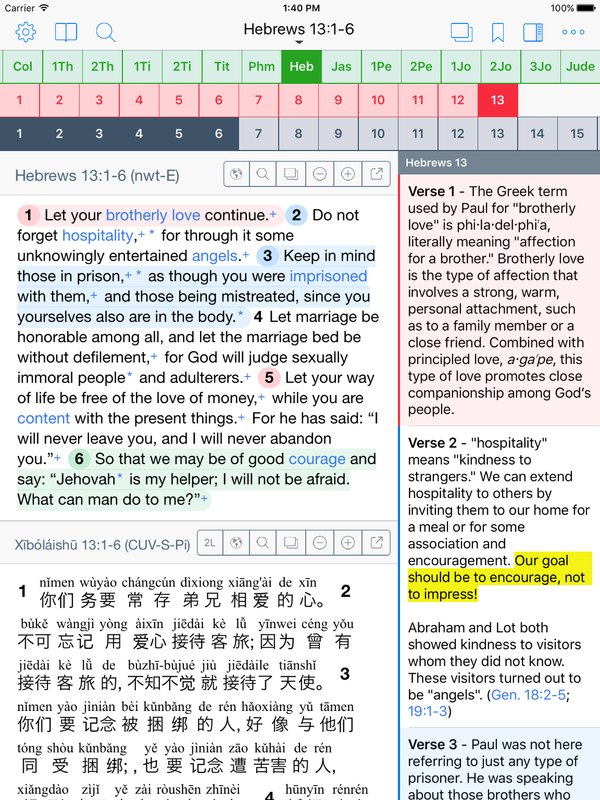 The example screenshot shows a Note with highlighted text and clickable scripture links. 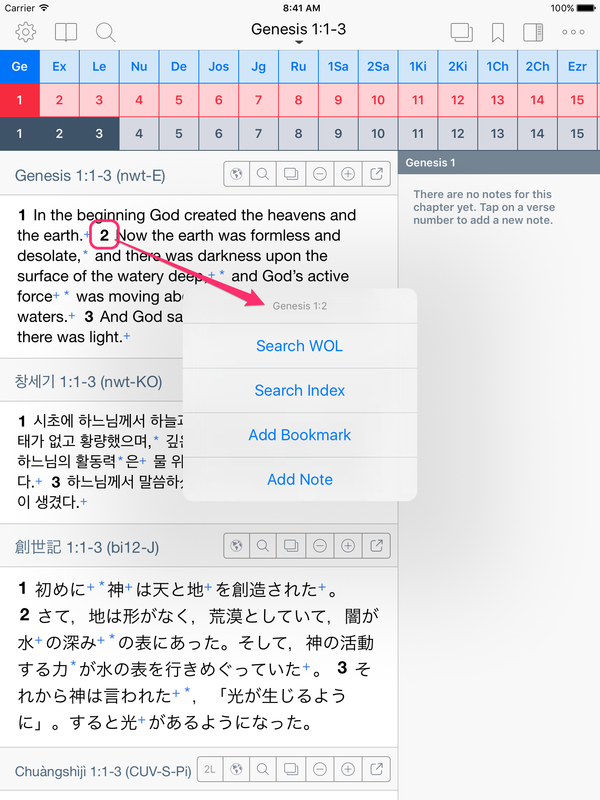 When you looking up a scripture, if you have a Note that matches the first verse you are looking up, then the Side Panel will autoscroll to that note. If you have a lot of Notes showing for the current chapter in the Side Panel, you often had to manually scroll to find the relevant note. Now it will scroll to the matching note automatically. 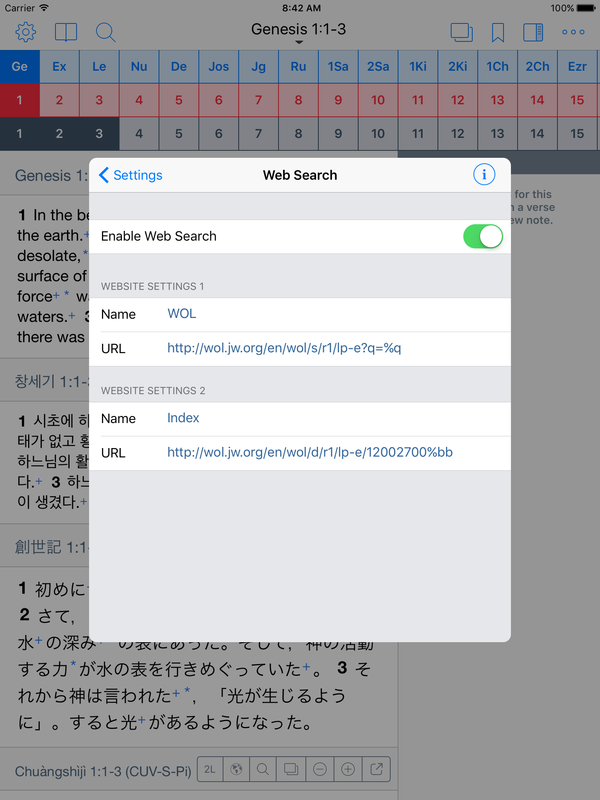 Do you use the Web Search feature of the Equipd Bible? This is an incredibly powerful tool, and allows you to hook into external website resources as part of your Bible Study. To turn this feature on go into Admin (top/left) > Settings > Web Search Settings. From here you you can turn on the Web Search feature, and configure the websites you want to integrate with. See the Info button (ℹ) on the toolbar? Click this to get useful tips and examples of how to use the Web Search. Do you use Microsoft OneNote? You can now create links inside a Note to a Section or a Page inside your OneNote Workbooks. Read more about how these links work here. Long-press on a Note in the Side Panel and it will now lookup the verse. This is an experimental enhancement – I could well change how this works in future updates. Supplementary cross-references and footnotes have been added for a number of EPUB files in Japanese, German, Chinese Simplified/Traditional, Italian, French and Spanish. You can now delete groups of Notes in the Note Library. On the top toolbar click the Library button (looks like a book) and then click the Notes button. Select a Book. From here you can slide left on a chapter row or “All Notes” and choose to delete all the notes in that section. The Vietnamese Bible Book names are now supported for the Hebrew Scriptures. Before they were only localised for the Greek Scriptures. Fixed an issue with the Spanish localisation which caused the interface labels to default to English. Fixed an issue the supplementary cross-references sometimes caused invalid HTML and some verses would not display. A user reported this issue with Luke 2:35. Fixed an issue with the Concordance search where consecutive searches for the same phrase would not show the results. Workaround added for Bible Reading Schedule descriptions being cut off in the settings window. 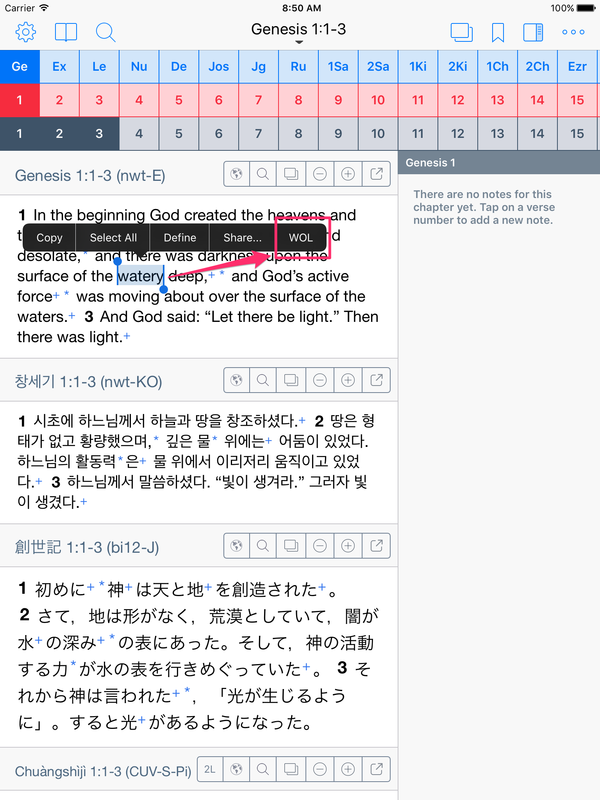 Fixed an issue where the EPUB Viewer window would not load properly if you clicked EPUB links across different Bibles. Fixed error where the Swedish NWT EPUB would load another book instead of Revelation. I hope you enjoy these changes in version 3.1. If you are enjoying the Equipd Bible app please take the time to add a quick review on the App Store. It helps others to see the value of the app, and it definitely helps me to keep motivated in supporting and improving it further. If you are able to help with translating the app please let me know. I am especially after translators for the following languages. 31 May 2016 NZDT: Version 3.1 is now with Apple for review. 3 June 2016 NZT: Version 3.1 was approved by Apple and should be on your App Store soon. I thought the last update was brilliant, but this new update takes it a step further. So handy for study and meeting. Thank you Matt. How go I get crossreferences for the German NWT-Bible like mentioned above? You need to wait until version 3.1 is out on the App Store Peter. This post is announcing a new version that has been sent to Apple for review but has not yet been approved by them. It is “coming soon”. Oh. Sorry. You right. I was too fast. There are many using the app in Split Screen mode. I haven’t had any issues reported. So there may be something specific in your setup we can zoom in on. If you could attach screenshots of the Bibles you have open at the time etc maybe that will help. Great. Fantastic. Very thanks. I have very using web search index. I’m so excited about this(already gave 5 star review on the App Store) that I’m giving this as a gift for those who do not have it and helping them to use it! Have already given it to others and we use it many times during the day. Thank you so much!